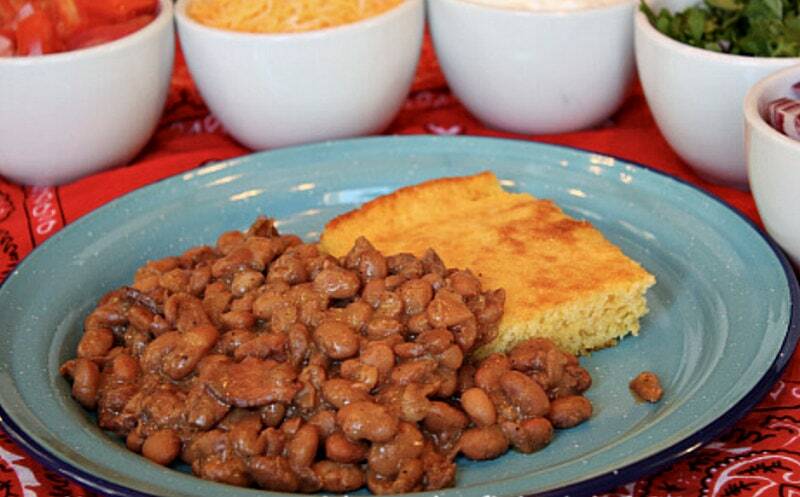 Pioneer Woman’s Beans and Cornbread is a favorite comfort food meal. Homemade cornbread is smothered with homemade beans and topped with a delicious array of fixings. 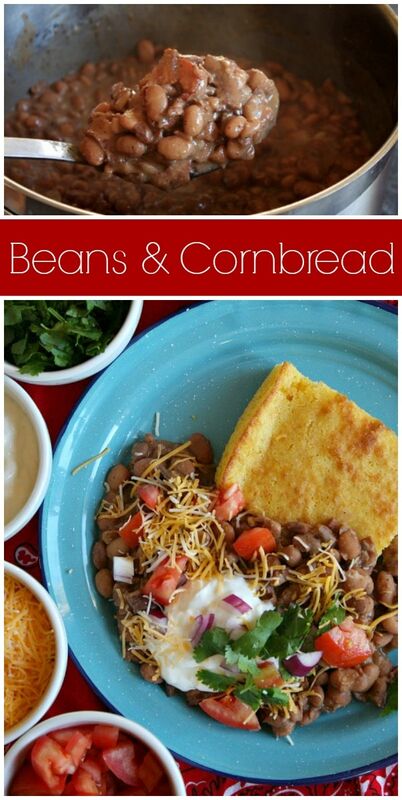 Beans and Cornbread: because you can’t make one without the other! It’s true! 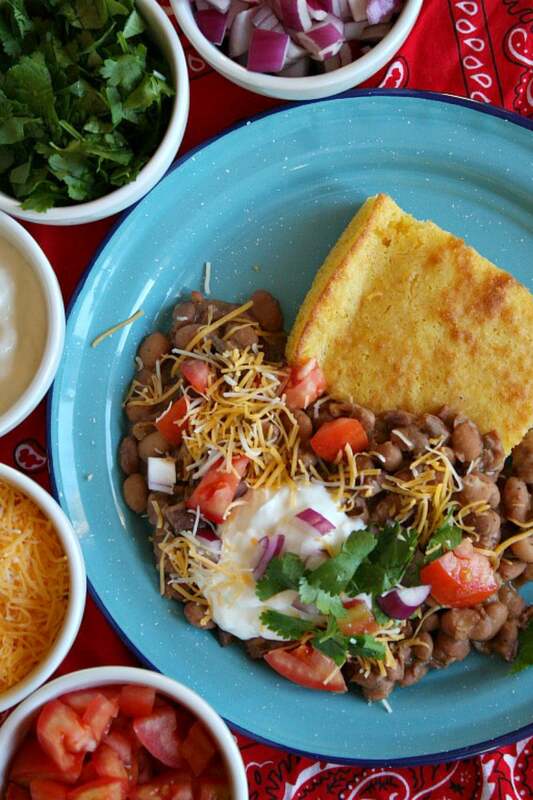 Beans and cornbread go together like peanut butter and jelly. They’re so good when served together. 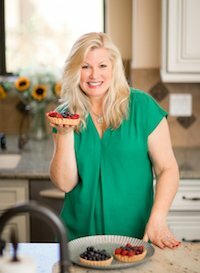 This recipe from the Pioneer Woman (Ree Drummond) comes from her first book: The Pioneer Woman Cooks. I love that she included this one in her book because beans and cornbread are exactly what I imagine her family eating on her ranch in Oklahoma! 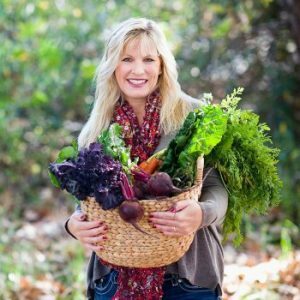 The majority of the recipes in The Pioneer Woman Cooks cookbook are easy-to-make, pure comfort food- perfect for filling the tummies of hard working ranchers. I let my son choose the recipe he’d like me to make and share from this book. He chose Beans and Cornbread! This recipe begins by rinsing dried pinto beans really well. One thing that’s important about rinsing beans is picking through them to make sure there aren’t any sticks or small stones mixed in (it happens!) Just remove them if you see any. The beans are put into a big pot with chopped bacon or ham, and then water is added to the pot until it comes up and over the beans. The beans are brought to a rolling boil, then turned down to a simmer and let cook for three hours with the lid on top. When the beans are almost done, the cornbread needs to be made. It’s a pretty typical cornbread recipe. One thing to note is that it’s not a sweet cornbread recipe. 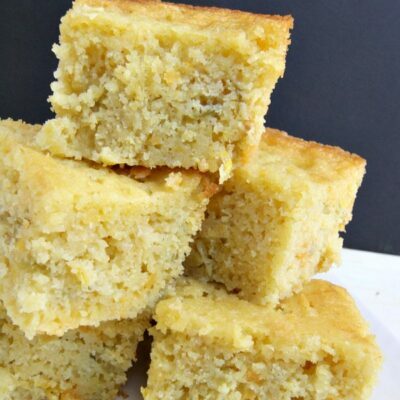 It’s considered a classic Texas Cornbread… grainy in texture, flatter and very crispy on the outside. And it’s the perfect sort of cornbread for pairing with beans. Back to the beans: when they’re tender, you’ll add salt, pepper, chili and garlic powder, and maybe a little oregano and cayenne too. That’s it- the beans are done. 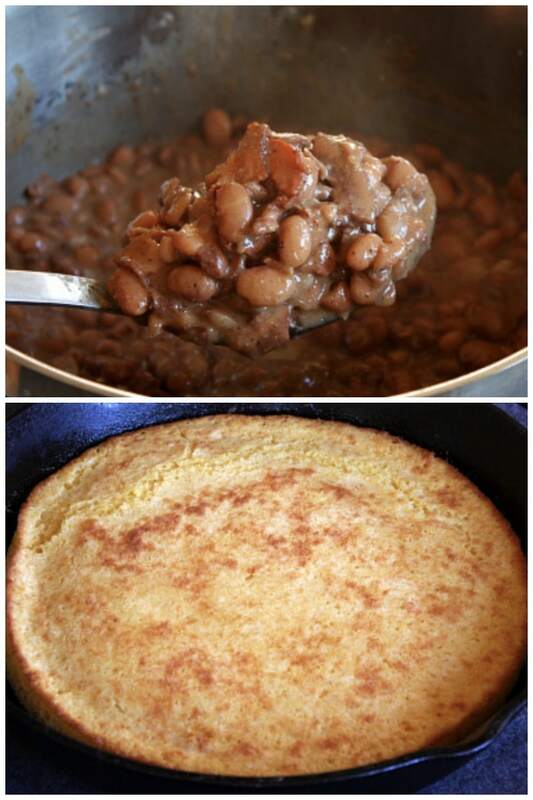 What do you serve with beans and cornbread? Plate your beans and cornbread side by side, or put a big old ladle-full of of beans right on top of your cornbread. Whatever you prefer! 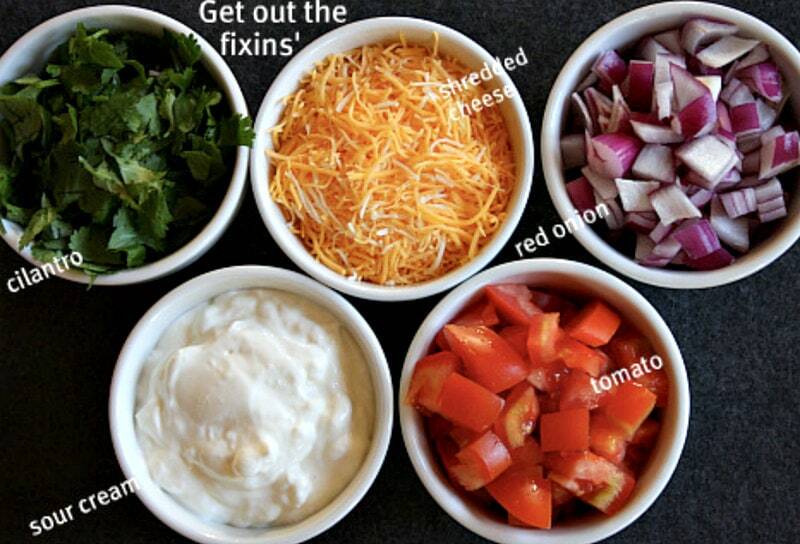 Top with freshly chopped cilantro, shredded cheese, chopped red onion, sour cream and/or fresh tomato. 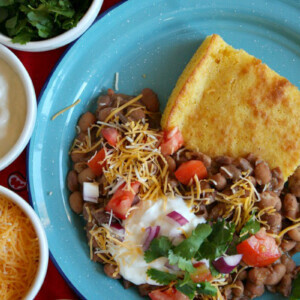 The best thing about serving beans and cornbread for dinner is that you can set out the fixings (just like tacos) and let everyone add what they’d like. 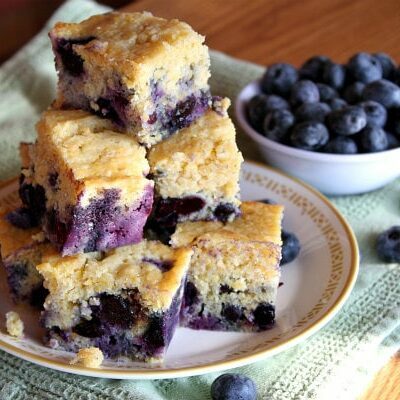 Beans and cornbread has its origins in the south- specifically in the Appalachian mountains. Soup beans were served with cornbread and greens. In rural areas (where food was scarce in the winter), dried beans were a staple food. 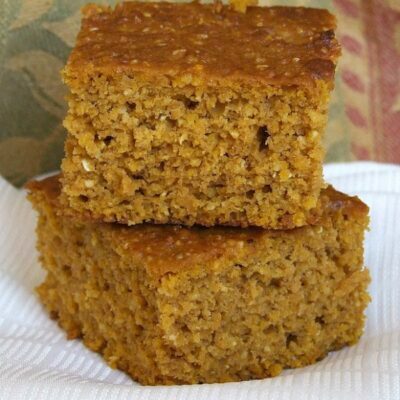 Sometimes people crumbled their cornbread into their beans and preferred to eat it that way. Fun fact from Wikipedia: “Beans and Cornbread” was also the traditional meal served to NASA launch crews following a successful space shuttle launch. The tradition was begun on April 12, 1981, by NASA test director Norm Carlson and was continued after every successful launch. Beans served over cornbread topped with all of the fixings. Rinse the beans thoroughly and pick out any little rocks or sticks that might have gotten packed into the bag along with the beans. Place them in a large pot with the bacon, and pour water over the top (1 or 2 inches above the beans). Bring to boil over medium-high heat, then reduce to low and cover. Simmer for 2 to 3 hours (mine took close to 3). If the liquid appears to be evaporating quickly, add more water as needed during cooking. The beans are done when they're tender but not mushy. Add in salt and pepper. Stir them up and add optional seasonings as desired. Preheat the oven to 450 degrees F. In a bowl, whisk together the cornmeal, flour, salt and baking powder. Measure the buttermilk and milk in a measuring cup. Stir in the egg with a fork. Add the baking soda and stir (it'll bubble a bit). Pour into the bowl with the dry ingredients and stir with a fork just until combined. In a small bowl, melt 1/4 cup shortening in the microwave. Slowly add the melted shortening to the batter, stirring just until combined. 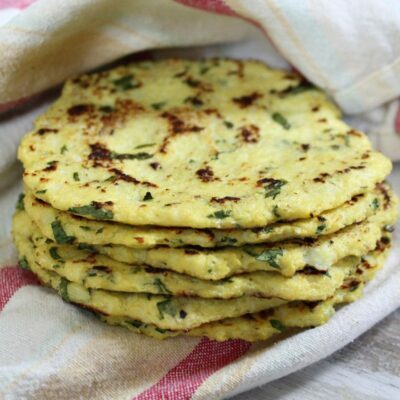 In an iron skillet over high heat, melt the remaining 2 tablespoons of shortening. Pour the batter into the hot skillet and spread to even out the surface. 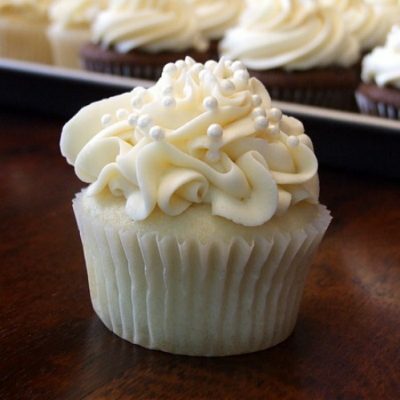 Cook on the stovetop for about a minute, then bake in the oven for 15 to 20 minutes, or until golden brown. The edges should be crispy. In place of bacon, you may substitute diced ham or a ham hock instead. Ham will add more flavor to the beans than bacon. I suggest being generous with the extra spice suggestions. Go crazy with the garnishes- they make this dish yummy. This cornbread recipe is not a sweet one. 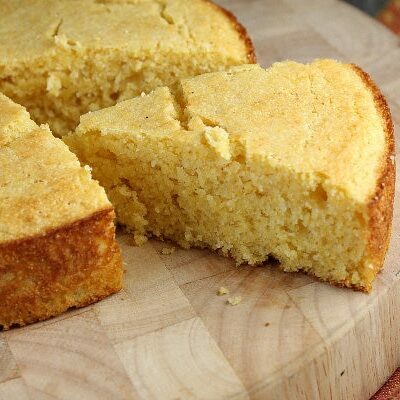 It's considered a classic Texas Cornbread... grainy in texture, flatter and very crispy on the outside.